The Australian Owlet-nightjar (Aegotheles chrisoptus) is small nocturnal bird found throughout Australia and also in southern New Guinea. This adaptable species can be found in many different habitat types, almost anywhere there are suitable hollows for roosting and nesting. 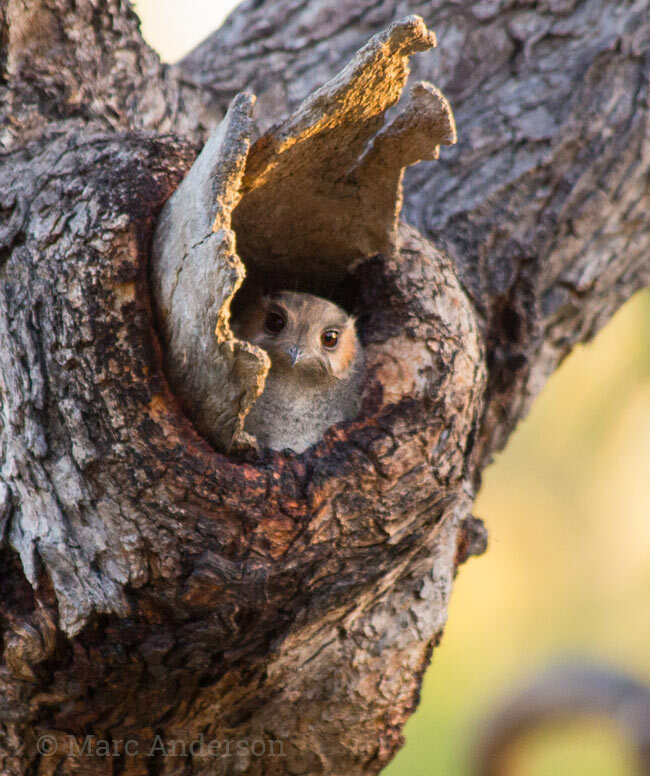 Owlet-nightjars can be difficult to locate during the day as they hide in their roosts, however, they can occasionally be seen sunning themselves at the entrance to a hollow. The best way of determining the presence of this species is listening for their calls at night. Australian Owlet-nightjars make a variety of sounds, the most commonly heard calls include a series of soft churring notes. The calls of this species are one of the most commonly heard sounds of the Australian bush at night. XC269667 This first sample contains the most commonly heard call of the Australian Owlet-nightjar. It starts with single descending ‘chirr’ notes, and is followed by a double note (often the call series goes on longer than this and can build to include triple-note phrases). Recorded in Capertee National Park, New South Wales. XC183575 This next recording was made during the day and is another example of the typical single, double then triple-note series. Although most-commonly heard at night, Australian Owlet-nightjars can sometimes be heard calling from their roosting hollows during the day. The bell-like notes in this sample are from a Crimson Rosella. Recorded in Yengo National Park, New South Wales. XC335530 The next sample contains a different call – a single phrase of five ‘churred’ notes. Recorded in Mutawintji National Park, New South Wales. XC335529 In the following recording a variety of less-commonly heard growls and shrieks can be heard. Recorded at Mutawintji National Park, New South Wales. XC287368 In this final sample, three birds can be heard making soft, single-note calls. Recorded at Yarriabinni National Park, New South Wales.